Say hello to Cheng Shunguo. Cheng has a rather unusual condition. That piece of cotton he's holding--the one that's bright green? It wasn't dipped in a bucket of floor cleaner or a cup of slurpee syrup. 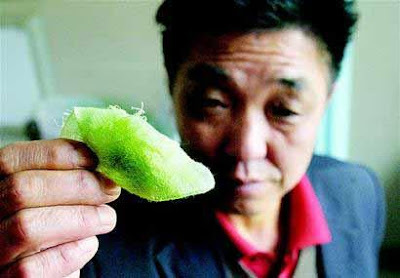 That green piece of cotton is covered in Cheng's perspiration. Yes, that's right. Cheng's sweat is bright green. Update: Apparently those doctors don't have access to the Internet. The condition is called chromhidrosis. And not only can it cause green sweat, but pink, blue, yellow, and black sweat as well! wow! its just like a gatorade comercial, but real! but i personaly would hate to have multicolored sweat, especialy multicolored sweat marks. ew! It's like the people in the gatorade ads! He would have to wear neon green for life to hide the sweat marks! Or he could choose not to engage in any physical activities. he should totally be in one of those gatorade commercials or something!!!!!!!!!!! It might not be an awful situation if you're a gym-class-hating middle schooler like me. Maybe it would be an excuse to sit out. Why Aren't My Pictures Showing Up?